Women represent 40% of new American entrepreneurs—and some states with shorter pay gaps also have the most business growth. But some states have lower disparities in pay than others. That fact brought us to ask a question: Could states with a higher commitment to equal pay have better business growth overall? That’s what we try to answer here. The result? We discovered a correlation that suggests that, indeed, states with more equal pay tend to see higher numbers of business births. Our analysts then cross-referenced their data with the percentage of women startup founders by state to further explore the relationship per between business creation and women in the workplace. Ultimately, we can’t definitively say that equal pay efforts cause higher business growth. But we do believe that supporting gender equality in the workplace is good for women, good for business, and good for the economy. Our work with this data prompted us to explore a few questions, which we ask below. 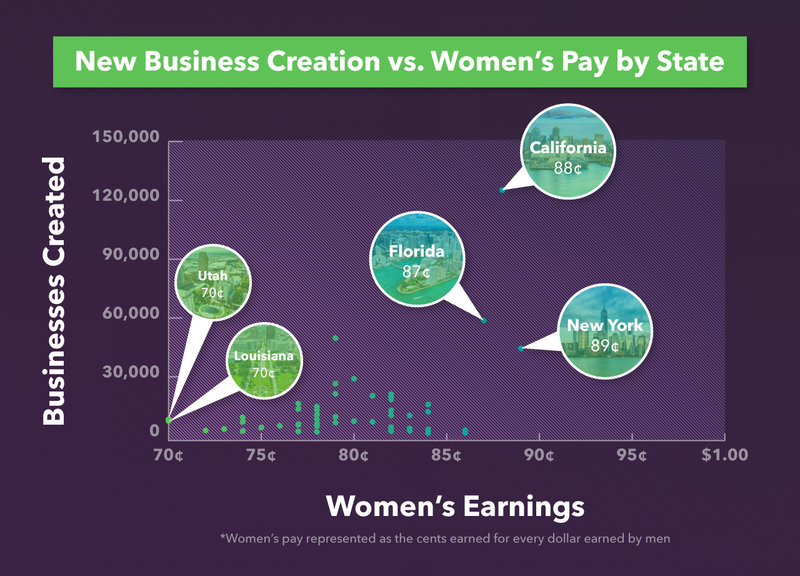 But first, here’s a look at how each state and Washington, DC, rank for new business creation and gender pay equity. Some of the nation’s biggest states are also producing the most new businesses each year. This set of data isn’t particularly surprising, but when we compared these entrepreneurially strong states to the states with the shortest gaps between women’s and men’s earnings, some similarities emerged. These five states have managed to improve the pay disparity well above the national average of 80 cents. New York eked out the best equal pay spot with women earning almost 90 cents to the dollar of men’s earnings. California has the highest number of business births and the second-highest gender pay equity rate. 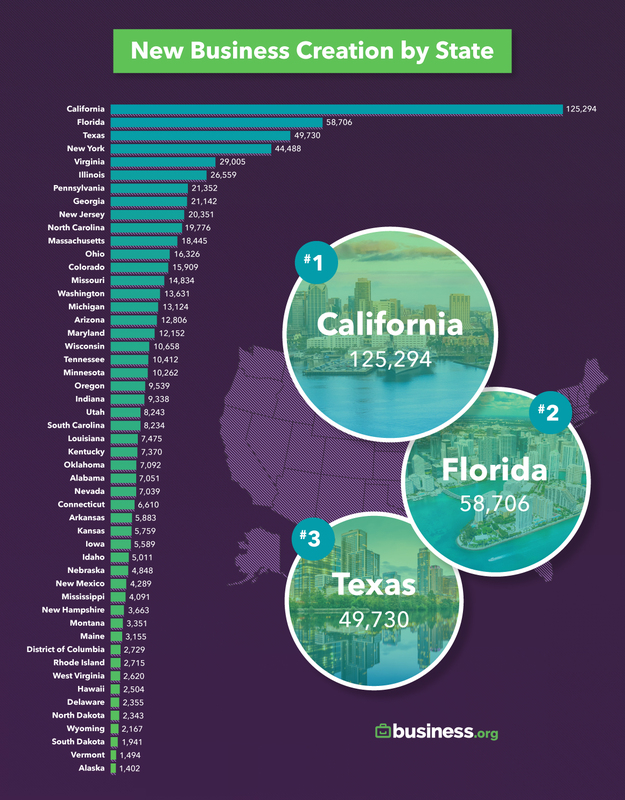 New York and Florida each land in the top five for both sets of data too. So what should we learn by comparing this data? Since we can’t infer direct relationships between equal pay and business growth, we’re left to wonder what’s behind the correlation. Could the people behind new businesses—especially millennials—be more invested in pay equity? Perhaps equal pay is more important to these millennial business owners. And states where millennial business-founding optimism is supported are more likely to see business growth outcomes. Are more entrepreneurs interested in starting businesses in states where they perceive fewer obstacles to success? Not only does thriving entrepreneurship encourage prospective new business owners, but seeing examples of women being compensated fairly and treated equally might also serve as motivation. Perhaps the states with the most success at lowering the gender pay gap have better resources and support for women interested in starting their own businesses. Economic policy and nonprofit advocacy are examples of ways to remove obstacles to success for women entrepreneurs. Do states with better pay equity provide both men and women better means to start new businesses? Starting a business is a risky endeavor. It takes careful planning, and there’s no guarantee of success. But the potential risks of becoming an entrepreneur may be mitigated in places where incomes are higher for everyone. Could states with higher pay equity be doing more legislatively to help women and minorities start their own businesses? Legislators in states that prioritize equal pay may also be more willing to support policies that provide assistance to entrepreneurs from disadvantaged populations. If that’s the case—and if such legislation spurs business growth while lowering pay gaps—then lawmakers nationwide may want to look to these top-performing states as examples for improving gender equality and supporting business interests at the same time.